At Costco I flipped through The Daring Book for Girls parked right there beside The Dangerous Book for Boys. These books are all about knowing how to do stuff – using a compass, sewing on buttons – things like that. They invite kids to an acoustic life. Hands on. And they must have got me thinking. 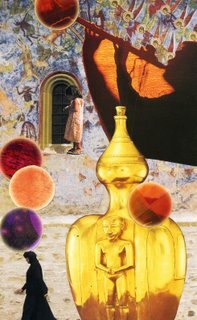 I made the SoulCollage card (pictured below) just before the Winter Solstice. It’s entitled The Call. “Called to what?” I’ve wondered. This morning I woke with the sense that I was called to a year of living dangerously*, but I doubt I’ll be heading off to Indonesia. I think my dangerous life includes a component described in the books above, a willingness to engage with life, not as a consumer, but as a learner, with all the floundering and failure learning implies. Failure makes me very nervous. I was never angrier with my sister, Barrie, than when she entered a swim meet at The Club and came in dead last. Buying a book and reading it is safe. Working on a project that matters could be a real mess. A friend once hurt my feelings. I told him I was scared to write, and he said, “You are afraid to find out you aren’t as good as you think you are.” Blunt, maybe, but accurate. So I’m ready to live dangerously. Just being myself (in whatever floundering way that can happen). Risking that I will be accepted and loved anyway. Risking that wobbling and a few falls are worth it to learn to write a story or bake bread or whatever else Life calls me to. The Velveteen Rabbit had it right, being Real is not for sissies.